Because Myakka River State Park is so huge, I shouldn't be surprised that I'm constantly learning new things about the park. Tuesday I decided to find out what was "behind the door" on SR 72. I've passed these types of gates several times and often wondered where the trails inside might go or what the trail might be like. 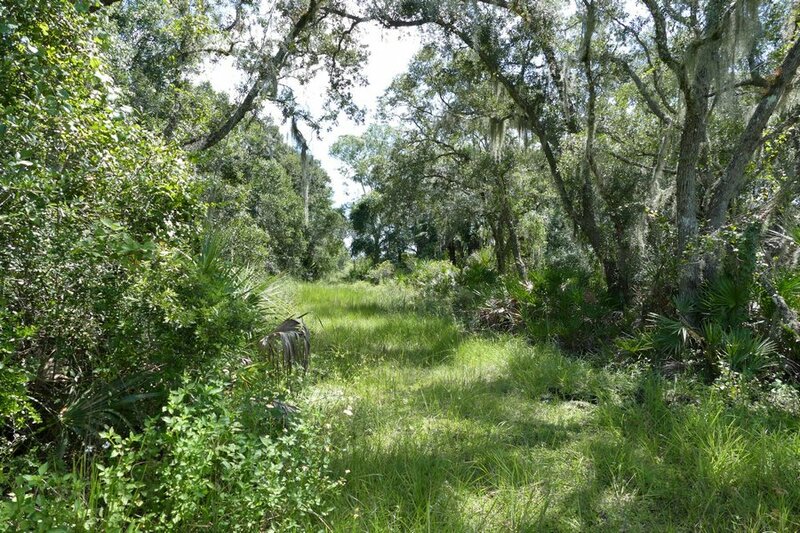 The gate I chose was the one that advertised the Myakka Island WildernessTrail. I don't know if this is where back-packers park, but for me it worked out. Because it's the rainy season, the "lot" was a bit wet but there was still an opportunity to find a dry spot. Originally I intended to walk down the trail to see where it might lead but when I saw a soggy trail that appeared little-used, I just knew that I would get lost. The beginning also offered too many options as to whether I wanted to go right, left or straight. Getting "turned around" would be quite easy for me. Had I been better prepared or more knowledgeable as to how to navigate all of the options on these trails, I might have tried, but as it was, I just took a few pictures and left. Reading trail maps is rocket science to me. 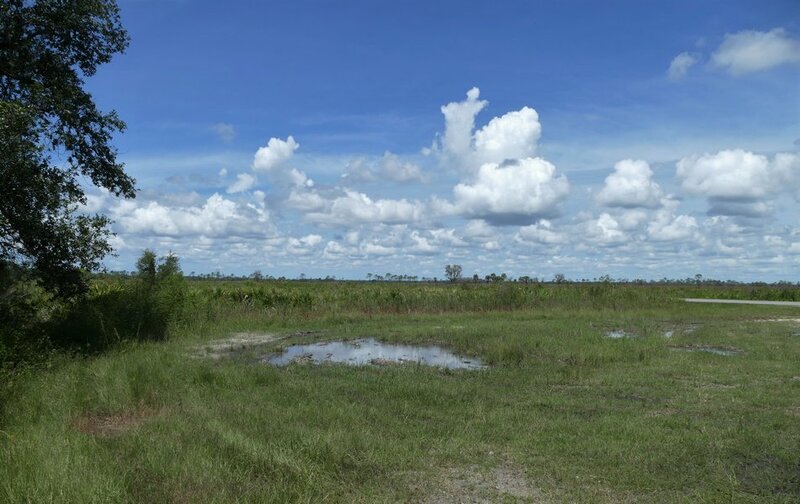 The area was wet, the grass was high and no doubt the biting flies or mosquitos would seek me out. Coming back in late fall or winter might be a more comfortable time to check out this trail. When I got home, I found out that there is a science to navigating these trails. 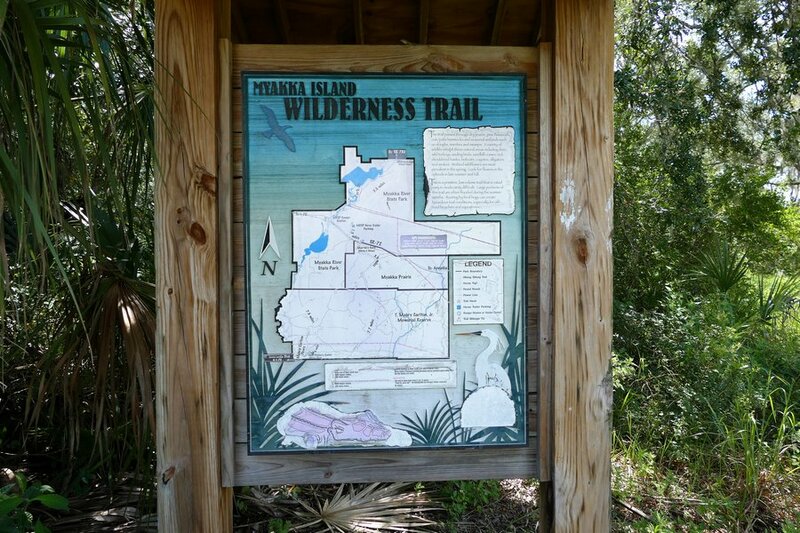 The Myakka Trail includes 38.9 miles of loop roads but on the trails are various colored markers letting you know whether you're on the main trail or one of the many cross-trails. Orange vertical rectangles designate a main trail and blue means a cross-trail. For the directionally impaired and trail inexperienced, this might not serve me well. I would be walking in circles as I choose one blue after another hoping to find a shorter route back to my car and the safety of a more well-traveled SR 72. 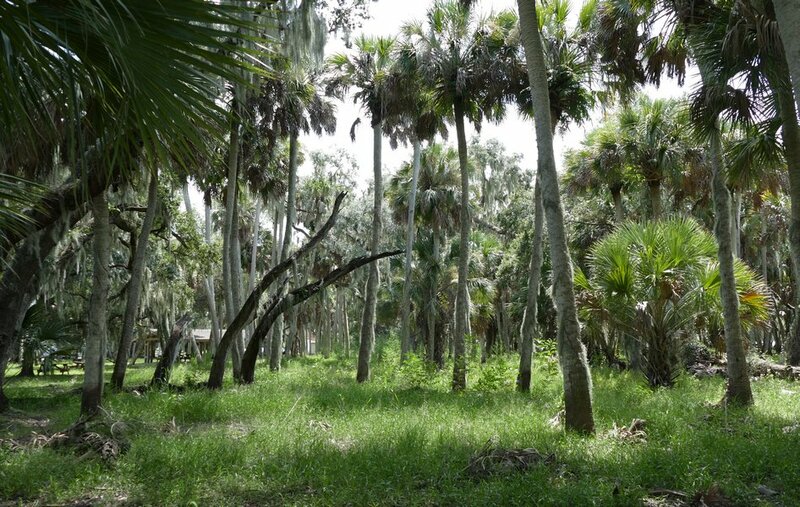 For those who like to hike or bike the back country, I read that there are 6 primitive campsites along the trail and 3 campsites at each campground (Mossy Hammock, Bee Island and Oak Grove). Before going out for overnight camping, you'll need to pay and register at the park. Campsites can be reserved in advance. It's recommended that camp stoves are used whenever possible and that a campsite be left cleaner than what you found. It's recommended that you bring your own water. Pumps are not always available or reliable. If you see water jugs, they are for priming the pump. Don't drink it. All water should be treated, boiled, or filtered before consumption. If you use the pump, make sure you re-fill the jugs for the next campers. Pets are not allowed in the campsites but leashed dogs are allowed along the trails. If overnight primitive camping sounds too much for you, you can always go for a short hike and enjoy the picturesque beauty that awaits. Whether it's wet or dry, there's bound to be a place that appeals to you. Since the Myakka River is starting to recede, a favorite trail of mine is not as flooded as it was a few days ago. The fields are also starting to give up the flooded look. Although many of the aquatic flowers had gone through their bloom cycle, the fields are picturesque and their placid look still beckons all passers by. It's now possible to get to the weir without wading through the woods and the path along the way will offer many opportunities to take some pictures. Although the weir is off-limits to visitors, nice views along the water or back into the woods are yours for the taking. If climbing trees is your joy in life, climb away. Tree-climbing alligators who like to slumber on tree limbs were nowhere to be found. If you thought that was ludicrous, here's what I had read online. 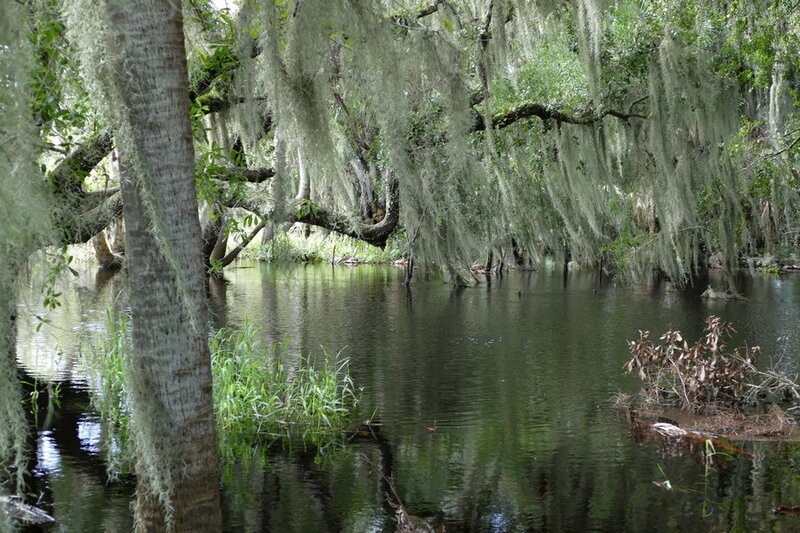 If you thought trees were gator-free zones, think again. ... And while most lay people would be startled to see one of the large reptiles on a tree branch, tree-climbing is actually “surprisingly common” behavior for alligators and crocodiles, according to a 2014 study published in the journal Herpetology Notes. Jul 7, 2016.